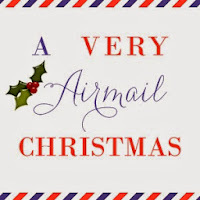 Last year, I participated in a "Very Airmail Christmas", hosted by Rebecca at Making Memories. It took very little time, and I was like a kid waiting for my card to come in the mail! This year, Very Airmail Christmas is in memory of Doria's mom, who lost her fight with breast cancer before Christmas last year. What a wonderful way to honor someone, by spreading happiness and the wonder of Christmas! All it takes is a little bit of time and a stamp. To read more about the exchange, click HERE. Want to join in? Send Rebecca an email at forrobin_christmas@hotmail.com before December 1st! I just made up a post about this to go up tomorrow. Thanks for the information. Sounds like fun.